Adding honorable would insult the integrity of the American people | Scanned Retina – A Resource for the People! ← Americans in uniform…true Americans honor you every day! Conspicuous by its absence, you will note the lack of the typical prefix, “honorable” which would normally be placed in front of your name. This is because, in my opinion, you no longer merit that distinction. As you are well aware, I frequently speak as the conscience of your constituency. Yes…Your conscience!, A service which I frequently provide you and at no extra charge. A service, to which both Rick and Kathleen will openly attest…I am that persistent and annoying reminder of your failed performance. In my opinion, sir…your repeated violation of our Constitution and your incredible failure to exercise your proper fiduciary responsibilities towards your constituency is painfully consistent. The fact that after repeated notifications you continue to fail to protect the interest of those of us who bestowed our unquestionable trust upon you. A trust you chose to dishonor by not acting in our best interests as We the People. I hold you personally responsible for the fact that you have yet to act upon the ineligibility of the usurper Obama. A promise you made to me in writing months ago. On behalf of all of the like minded electorate who collectively act as your employer, permit me to thank you for sticking it to us…again! I can assure you…on the basis of a continuation of your current policies and flawed practices, your chances of reelection are non-existant. To my request that you filed charges on my behalf against Mdm. Pelosi for committing election fraud that you unceremoniously ignored, let me thank you once more for heroically representing members of your constituency. However Sir, to your credit, that was not too bad. For by comparison, Mr. Boehner and Ms. Bachmann, and the chair of the House ethics committee, your transgressions would appear to be of a minor nature. And then there is the curious nature of the following item. Perhaps you would like to elaborate? Eight times Rohrabacher…and two by your own hand….even Issa is represented in this curious chain of events. There are lots more of these transgressions documented. They will be presented at the appropriate time. 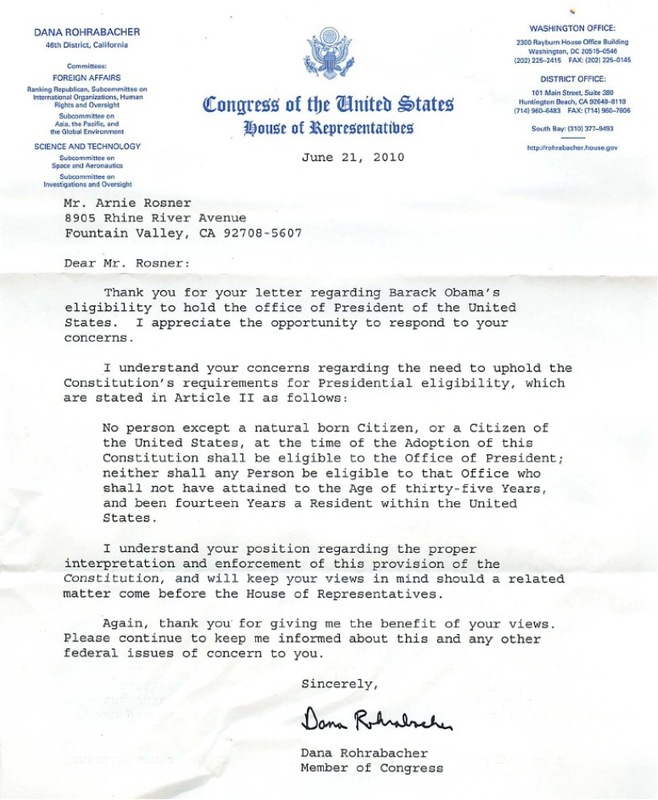 Rohrabacher…under these circumstances an honorable man would resign.